SD, hope your ceiling project when well. I hate doing things overhead. Are you guys getting hit with tons of snow? I feel discombobulated lately with DH home from work, I have my routine down and now it's thrown off. I feel like I'm not getting as much done as I used to. Poor DH, his list of things to do are growing, he is going to have quite the list when he gets better. So far it's, brakes on my car, oil change on my car, bathroom sinks are running slow, new garbage disposal put in and a piece of trim (in the highest peak) blew off the house during our last wind storm. He is always so good about keeping up with everything but of course everything happens when he can't do anything about it. We're only working on a small section of the ceiling so far, Rabbit. We have a large cabinet that fits in a little nook in the bathroom. It's too tall to slide through the doors, so we moved it out to the middle of the floor. We're scraping and painting the nook first so we can get the cabinet out of the way. Not much other way to do it without massive effort to move it out completely and then move it back in. Can't wait to get it all done. It will be a big change. Things should speed up once we get the cabinet out of the way. Rabbit- Can the car be taken to a shop for the oil and brakes? I used to rely on DH for car things but now do them on my own. He's gotten so used to me doing them that he used to ask me to do stuff for his car. The ham that has been thawed for a week must've been ok to cook as DH cooked it last night. Good. I really didn't want to throw it out as that would've been a huge waste. And I would've been very upset. DS2 may take a summer class at the local college. It has a online version but he says he wants to go to the class. Which means that I'll have to drive him to/from and not get sleep. Last Summer, I took him there but DH had to pick him up as I had to get to work. The cost difference between taking a single online course or physically going to class is $300 (online is more). I guess the cost of gas and lack of sleep is worth NOT paying the $300 but ask me that after the first week and I may change my mind.... I'll cross that bridge later. The local college has a list of scholarships and the good news is that the scholarships can be applied to any college, if you win. One is due on Monday, so I printed it out and told DS2 to get it done so it can get mailed in. He applied to many scholarships from the university and will hear back this month, if he wins. I'm hoping something comes through as I said I'd pay for college. Yup, so major belt tightening is on the agenda until he graduates. DH said to take out loans but I don't feel that loans should be the first source of tuition payments. I'm gonna give it my best shot to pay it all as DH isn't helping to pay. We all signed for loans to help DS1 with college and DS1 is paying them back on his own. As a Christmas gift, I do pay $500-$1200 towards one of them. Laundry and dishes going and I'll nap before heading to the gym and then to work. rujerro, Dh has always did our oil changes and brakes. He even buys lifetime warranty pads for the brakes so we only have to buy them once. We usually keep our cars 14 years so that's quite the savings! Neither is very urgent at this time, they just need to be done otherwise I would have to bite the bullet and take the car somewhere. I never knew online college courses were more money! Seems odd to me. Crossing my fingers your son gets a scholarship. I got home from work today and DH told me he fixed the drains on the bathroom sinks. He is not supposed to be doing stuff like that yet. I told him I'm going to have to hire a sitter for him while I'm at work! Looking forward to a nice relaxing evening, so glad it's Friday. Still working on the bathroom. We will have the ceiling scraped shortly, so the worst of the mess will be over. Removing the popcorn is messy, but not as bad as expected. Then there's the rest of the house. About 1,900 sf to go. I think the rest will be a winter project, so we won't be doing any more this spring except maybe the guest bath ceiling, since we have all the stuff gathered up already. It's a small room that would go fast. SD- I'm glad the bathroom ceiling is small. It will look nice when it's done. Dlrcpa- poor thing. I hope the pup feels better. My sister's pets have the same issue and what the vet said was that their food must be a dry dog food and he recommended a very expensive brand. They can't have wet canned stuff. One ended up in surgery due to this ($3000 surgery). Not saying that your pup has the same thing, but just what my sister went through. No spending today. I made scalloped potatoes and ham. It was good to me, but DS1 said it didn't have much flavor. I told him it was organic ham and not the sugar soaked ones that we had in the past. DS2 finished a scholarship that has to be sent and postmarked by Monday. He had to study Physics and finish a project as well. He was a bit cranky but it was understandable. My niece is trying her hand at modeling. She had photos done today on the beach. I hope she gets a job. She is young and has low self esteem. I told my sis to send me some of her cards and see what I can do. There's a family whose daughter models, so she may have a connection for my niece. A lot of rain here the past few days. Woke up this morning with headache due to pollen. Doing laundry today and making a raspberry cheesecake later. If it is warm enough outside, may divide aloe Vera and repot. We shall see. Raspberry cheesecake sounds so good! Now I want some. Such a small world. In church this morning while saying hello to the woman sitting behind us I remarked that she looked like my Dr., turns out she's her sister! Then after service we were chatting and my DH mentioned that our nephews wife and kids, who we had invited to church, had been coming for a few weeks and then stopped coming. She said ****** and ******? She knew exactly who he was talking about because she knows our nephew and wife! Quite well in fact. I said I am going to have to tell ****** and ********* that we ran into you today, we will be seeing them this afternoon at their sons recital. She said the recital in (named the town). She was going there too to see someone in the recital! Crazy. just has been major allergies, housework, groceries, the reg stuff. errands etc. dh is out with a friend this morning. breakfast and a bike ride. good for him but the bruise from his wipeout just came out after a week. he says it doesn't hurt but I am worried about clots etc. finished dd blanket just sewed the corners of the comforter inside to the fabric cover. got couple of cupboards moved so I put things away. one is just holiday decor. took the easter stuff out. one bag turned out to be a mix of stuff toys in there too. slowly things are happening. behind on my crochet along hands and allergies. about 12 squares to go until the last part comes out tomorrow. not sure what is for dinner. maybe tacos. dishwasher going. washer after. since the sun is out ds can put all out the maple tree seedlings out. I'm listening to food podcasts and cleaning and decluttering today. My brother's girlfriend just left him. He can't afford to stay in their apartment in the capital alone, and he's also traveling too much with his job to keep their dog. I'm seeing him in a few days. I think he needs some big hugs. He thinks he'll move back to the area we come from now. Funny thing, I did the same thing last year, when my ex boyfriend and I broke up. After 10 years in Denmark's second largest city, I moved to a 1500 inhabit town with two buses an hour. Only place I could afford on this island, where I could keep my cat. My brother is looking for a place in Denmark's third largest city. I can't imagine him living here We grew up in a town like this and moved away almost as soon we graduated highschool. I went to Aarhus and he moved to Berlin and then Copenhagen. I just got my spoiled cat a window hammock and she loves sleeping in the sun and looking at birds. Last edited by Tine; 04-15-2019 at 08:37 AM. Working at the soup kitchen and then coming home and working in the garden. That is hard Tine esp with a pet. sunny now so my allergies are better today. so backward this time. rain it is worse. since I am carless and thinking about what to do if I didn't have one for a while. savings for sure but dh is used to me doing all the errands on my own. dh picked up the basics grocery wise yesterday. just did leftovers for dinner last night or hotdogs. stew needed eating. rest of meatloaf to the crows. put out some bread at night for raccoons since they keep getting into the recycling. defrosted mystery meat..turned out to be leftover roast chicken I saved for soup so making soup plus the ground beef for tacos and freeze extras. I add black beans to it. picked up some cumin to stretch the seasoning packs. ds pulled all the maple tree seedlings all over. I moved a couple of things downstairs. my dresser full of beads from under the window. had a few of the basement spiders upset..they make a tunnel web and eat the pill bugs that come in under the basement door. told ds he should be happy I didn't make him do it. he doesn't like spiders. housework, easter decor up, declutter the usual. got tickets to the local musical w mil coming. her mothers day gift. they always do a great job. $215 out for that. hopefully mil gets on new antibiotics so she is better by next saturday. just watched the last esp of all gardens great and small. makes you want to get out there. off to laundry and dishes. 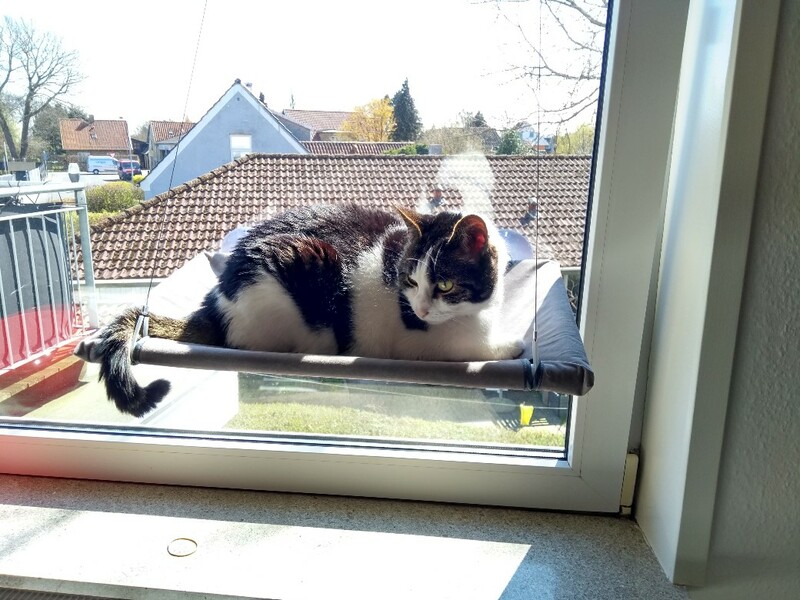 Tine, your cat looks so comfortable in her new hammock! I saw those at Costco but thought they might not hold my fatties. They're 14 lbs. each. One of my lovely kitties destroyed one of our bedroom blinds yesterday. DH is done, he said he is not buying anymore blinds. Good day at soup kitchen. Besides veggie scraps for my chickens, I got bread, eggplant, bag of potatoes, tons of salad fixings, and zucchini. What Are Your Plans For 2019? Will You Be More Frugal?